I could see her trying to work out which poor animal’s ears they could possibly be before I set her mind at ease. If only she’d known that ears were the least of her worries… Unknown to her, there were anchovies lurking in the sauce. They had dissolved completely into the butter I’d sautéed the broccoli stems in, adding a rich, salty depth to the finished dish. 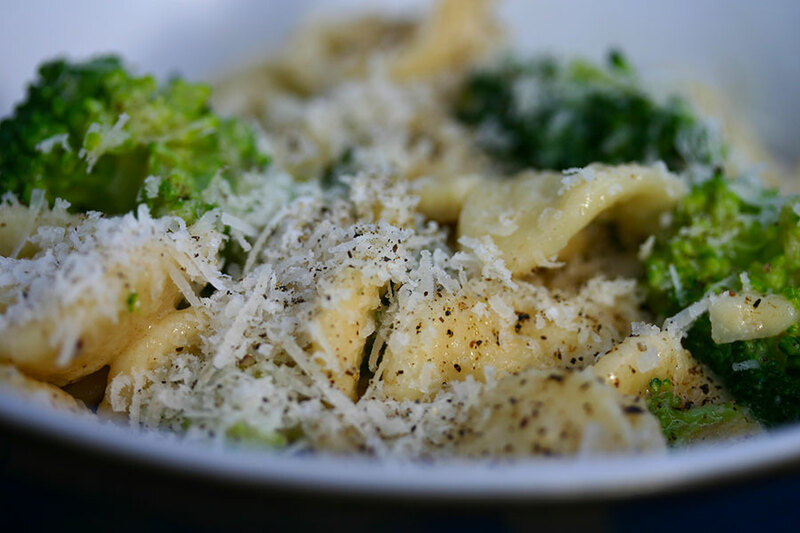 Actually, I often make orecchiete broccoli without the anchovies, adjusting the seasoning accordingly. And if orecchiete prove hard to find, conchigliette (little shell-shaped pasta) work fine too. Cut the broccoli florets from the stalk and break into bite-size pieces. Set aside. Peel the broccoli stalks and cut into small pieces. Melt the butter in a large frying pan over medium-low heat. Add the broccoli stems, garlic, chilli and anchovies (if using). Cook, stirring occasionally, until the stalks are golden and tender and the anchovy pieces have completely dissolved. Add the orecchiete to the pot of boiling water, and cook for ten minutes, or until it is a few minutes away from being ready. Now add the broccoli florets and cook a few minutes more. Drain the orecchiete and broccoli, reserving some of the cooking water. Add the orecchiete and broccoli to the frying pan, and stir to coat. Add the grated parmesan and season with salt and pepper. Loosen with a bit of the cooking water if necessary. Great — glad it was such a timely post!